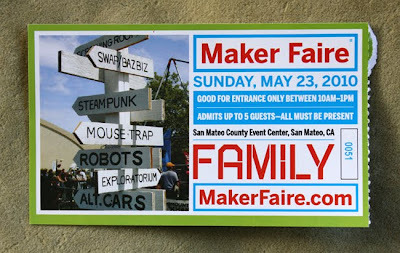 Despite having lived in the Bay Area for nearly six years, we haven't been able to attend the annual Maker Faire until this year. It always seemed to coincide with the dates that we were back visiting in the UK. This year however we got to go and it was all sorts of fun! We got one of the Sunday tickets that gets a whole family in for $50 providing you enter between 10am and 1pm. I don't even know where to start with telling you about all the interesting, inspiring and exciting stuff there. The kids loved the giant mouse trap, and we all were keen to see the coke and mentos display too. 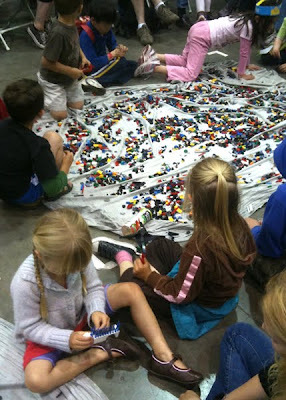 There were two indoor activity areas that the kids REALLY loved, well, three if you count all the lego that was out on the floor by the Bay Area Lego Users Group. There was an area by a group called "Smile Pathway", who you can find at http://www.howtosmile.org/. From checking out their website, they seem to be trying to collate ideas for those who teach outside the realms of a traditional classroom. We spoke to Sherry Hsi there, who was from one of the partners (Lawrence Hall of Science in Berkeley). They had out a load of simple musical instruments that could be made with household items. 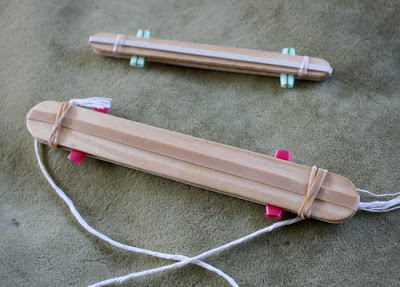 Very simple, but very fun, and they had plenty of materials for kids to make their own too. 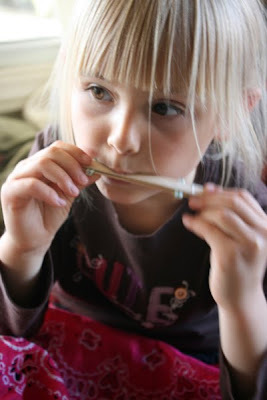 Sherri showed us how to make two very cute rubber band reed instruments, made with a couple of tongue depressors and a drinking straw. They are apparently called "sound Sandwiches", and there is a pdf instruction sheet here, provided by The Exploratorium (another partner of Smile Pathway, and the place that inspired us to paint a whole wall with glow in the dark paint). We have made more of them this week for other kids that have been over (with popsicle sticks, but my friend, who is a vet assures me she can get me some tongue depressors to feed this habit). 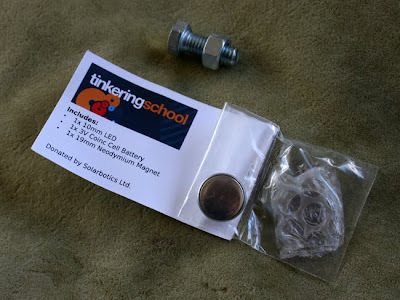 The other big hit with my kids (especially my five year old), was the "Tinker your way out of this 2.0" set up, run by Gever Tulley of Tinkering School. 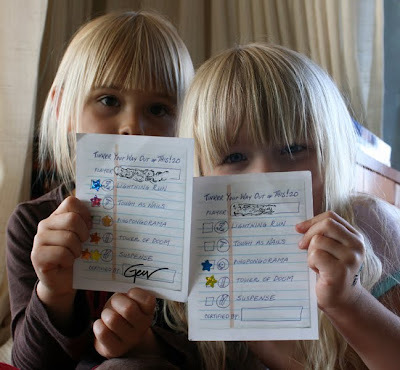 They had five different challenges for kids. Challenges that could be completed in a number of different ways, and that could be taylored to various different ages. My five year old spent a good half an hour to fourty minutes working her way through these and loved it! 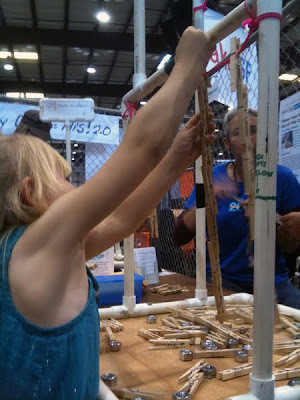 She definitely felt the strain when her suspended peg contraption broke a number of times, but Kudos to her for sticking at it and making it strong enough to hold an extra two weights for bonus points. I wish I'd taken a couple of pictures of how into this my five year old was, but luckily it didn't matter that I missed that opportunity, because Gever Tulley was busy taking his own photos and a cute one of both my kids popped up in his Flikr set from the event. Look at the concentration on that face! My younger daughter, who turned four in March, only did two of the challenges before wanting to go see something else with dad, but she still got a bolt and nut for her efforts, which pleased her emensely (although I think the game of "which hand is it in" by Mr Tulley was just as cool in her eyes). She wanted to stick it in our giant geoboard, but it's a bit too big. I suppose I should really get the drill out and make a bigger hole for it, because she was quite insistant. Oooh! I just googled "giant geoboard" to quickly find the link to our project and look what I found! Dad Labs have done a video on making one based on our project! How cool! They contacted me to ask about if it was ok, but I never realised it was done. I really should have said hello properly to Gever Tulley, only he looked so busy with everything and sounded a little like his voice might have been on the way out too (He did give a couple of talks also during the Maker Faire event). I think maybe my shy nature is to blame though for me not just shaking his hand and telling him how much I'm on board with his vision. Yeah, I'm kinda shy. Once you get me talking I'm not shy at all, but I'm just not very good at introducing myself. 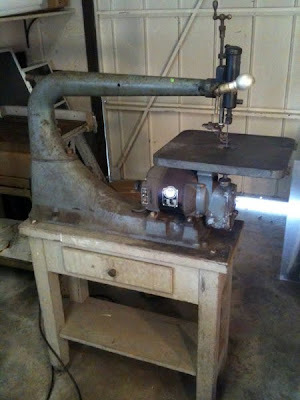 Aaaaand in other exciting news... We bought a prehistoric scroll saw for $30. It's fabaroo! It's a gorgeous, ancient, affordable hunk of possibilities! I haven't quite managed to establish whether there is a moratorium or an outright ban on turning the Nissan Dissapointment into an artcar yet. I KNEW I should have made myself pay for this! Next year I absopositively will not miss it. How fun! Glad you guys had such a blast. Oh man, you're so lucky! Your kids are too, but you're the one I'm really envious of. I wonder if I can cut myself free next year to head down. 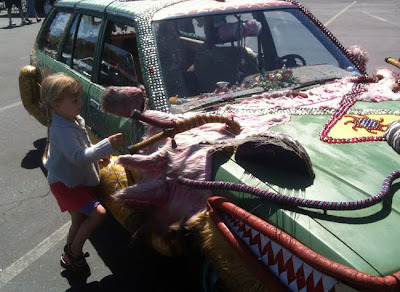 My Subaru is over a decade old now and has gone though a number of art car phases. I'd never thought of letting the kids have a hand in it. I was recently offered a fiberglass shark fin . . . Thanks for sharing! I'm so sad I never made it there when I lived in California :(. I'm so jealous... I wish I could've been there! 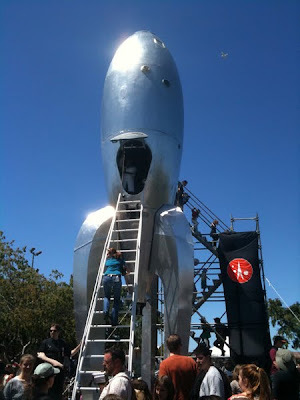 They did Maker Faire in Austin twice and then stopped... I still need to figure out what is up with that. I am SO going to tell Gever about you and blow your cover. He would love your ideas/vision. Oh and by the way, did you know Dadlabs is Austin? That was the one bit of media coverage I was able to get Gever when he was out here. You're so famous! Vacation and International postcard swap fun.